Whether through fan mail sent to celebrities and the popular press, critical pieces, derivative narratives such as fan fictions and other outlets, media audiences have often chosen writing as a privileged way to extend their experiences of reception. In very different contexts indeed, individuals have written about the cultural objects they loved or execrated, using various media to express themselves. If preserved and accessible, all these texts can reveal a lot about their authors, but also about the composition and structure of the audiences they belong or have belonged to. Above all, they are spaces in which the making of gendered identities and relationships within these audiences can be observed, providing scholars valuable resources to study media reception from a gender perspective. This special issue of Gender in Series aims to gather works dedicated to the analysis of audience’s writing practices through the lens of gender, broadly speaking, to illuminate both the media cultures and the social discourses produced by these specific audiences. Previous works have already showed how “ordinary”, “domestic” or “fan” writings may be highly gendered and researchers are therefore invited to provide new case studies. Contributions that focus on the writers’ profiles, their writing and, if applicable, publishing conditions, are particularly encouraged, as well as those interested in the social meanings and uses of audience’s texts from individual or collective perspectives. In the line of works that have explored the relation between reading and gender or the construction of identities through mass media, it seems essential to understand how these writings can be means of self-presentation or how they convey ideological representations and determinations about gender. It is all the more important since they are inspired by cultural contents which are themselves embedded within social and gendered norms. Besides, as writing forms continue to have a central role – offline and online – in reception practices, this special issue also welcomes comparative works establishing bridges between different kinds of writing materials or between heterogeneous eras or contexts: identifying the proximities or ruptures within forms of textual reception will be helpful to discuss how media cultures and gender issues interact and how these interactions may change in time. Contributors should feel free to focus on any type of written textual reception, whatever its content (correspondence, commentary, fiction, etc.) or media (paper, digital, etc. ), and whether the texts were supposed to be publicly released or to remain in the private sphere. This special issue wishes to address textual reception in its diversity: articles may deal with objects of affection (or disgust) from literary, musical and audiovisual fields or deal with celebrities related to arts, sports or even politics. Proposals from any of the different social sciences (sociology, history, film and television studies, cultural and media studies, etc.) will be considered, provided the analysis is based on empirical material, derived from archives, ethnographic research and/or digital research. Articles may deal with the most involved amateurs, such as “fans”, but may also focus on more “ordinary” cultural consumers, as long as they have taken a pen or a keyboard to express themselves. Finally, even if studies about writings produced between the end of the nineteenth to the twenty-first century are preferred, more comparative works or approaches relying on older writings will, when appropriate, be taken into account. The Internet has recently celebrated it’s 25th anniversary and as Gartner’s hype cycle on emerging technology shows the Internet has already give rise to new, emerging as well as established technologies, platforms, ways of interacting and creating content. In the humanities we traditionally study cultural content in it’s many different shapes and forms from letters and literature, to paintings and pottery. However, 25 years with the Internet has thoroughly affected the amount, shape, creation of and way we interact with the cultural content found on the Internet. This in turn has influenced the theories as well as the methods with which we can study cultural content. The field of Digital Humanities has built itself around the idea of using digital methods to study more traditional material such as handwritten or analogue documents. However, in recent years there has been a growing focus on the study of born-digital material, using both newly developed digital methods as well as more traditional methods. This issue will include research papers that deal with methods, possibilities, challenges and in particular ethical considerations in relation to humanities research into Internet content. The editorial team will review all abstracts, and authors of selected abstracts will be invited to submit full papers by 1 February 2017. Research into celebrity tends to focus on larger and more powerful media systems and how the logic of mediated fame has been formed and developed in larger and more powerful nations. Considering that 60% of the world’s nations have populations of less than 10 million and 48% of nations have less than 5 million inhabitants, this issue seeks to explore the role, value and function of celebrity in such localities. Historically the study of celebrity has followed the paths of organizational development and the cultural templates set by the success of Hollywood and the American media. Although significant differences in the formation of global and national celebrity culture are apparent in Europe (e.g., England, France, Italy) and other large and emerging global markets (e.g., China, India) these developments beg the question of the dynamics of celebrity in smaller nations. More explicitly, within such localities the formation of celebrity systems are subject to tensions between the global and the local. Drawing on the work of Victor Turner and Homi Bhabha, there is a need to explore the condition of inbetweenness and the liminal condition of local celebrity, charged with representing nationhood – itself internally conflicted and contested – and participation in the global celebrity order based on American and Western media systems. It could be argued that the national features of global celebrity, especially Hollywood and the American media, is rendered “invisible” as the universal touchstone of fame. Conversely, for the imagined communities of the periphery, celebrities are required to contend with notions of cultural specificity and traditions of representation and identity. So whilst it is true that the tension between the global and the local is a feature of celebrity culture per se, in small nation contexts this tends to be less a phenomenon between the ordinary and the extra-ordinary than between different versions of collective identity. What are the specificities, nuances and complexities that underpin the development of celebrity in smaller nations? How do smaller nations respond to the the influence of global Hollywood as it interfaces with local traditions of prestige, performance and cultural identity? Do local “celebrity imaginaries” under pressure to gain the economic advantages of following global formats, essentially mirror and replicate globally powerful forms of celebrity? Alternatively, what are the differences, distinctions and cultural conflicts that emerge in the formation of such “glocal” celebrity systems? Does “liminal” celebrity germinate, operate and mobilise different logics of fame and moral economies of representation? Across a range of celebrity fields – in sport, entertainment and politics – how do localised nationalist discourses come to the fore and how do these play out in the logic of self-commodification and formation of personae? How do the factors of smaller market size and limited economies of scale enact a territorial or geographical compression on systems of value and prestige, geographic distance or isolation from the West structure the discourse of celebrity and the development and maintenance of liminal celebrity cultures? In order to consider the interaction of the local and global (e.g., economic, political and cultural), as well as possible paradoxes and tensions in the formation of small nation celebrity, we welcome submissions that probe celebrity in any small nations located in Europe, Asia, Middle East, Africa, Latin America, the Caribbean and Oceania. Interested authors should send a 250 word proposal and 200-word biography to both barry.king@aut.ac.nz and d.c.sturm@leedsbeckett.ac.uk by October 21, 2016. Acceptance notices will be sent out by December 9 2016. For accepted proposals, completed essays of 6000-8000 words will be due no later than April 7, 2017. Final publication of the special issue is expected early 2018. Only previously unpublished essays will be considered. of sustained critical examination has yet to be published and is the gap this book seeks to address. and be approximately 8,000 words, inclusive of endnotes and bibliography. These are due April 1, 2017. In 2006’s /Convergence Culture: Where Old and New Media Collide/, Henry Jenkins defines “convergence culture” as “the low of content across multiple media platforms, the cooperation between multiple media industries, and the migratory behavior of media audiences who will go almost anywhere in search of the kinds of entertainment experiences they want” (2). In contemporary culture, we are no longer merely passive consumers of media: we are participants in the narrative to the point where fans often actively influence outcomes and storylines well after a primary text has been released. J.K. Rowling’s tendency to continuously play with her /Harry Potter/ characters and stories a decade after the “final” book of the 7-part series was published is indicative of a growing trend towards interactive, convergence storytelling as part of the fan experience. Rowling certainly has her supporters and critics, and arguably, no one embodies the art of transmedia storytelling quite like Rowling. Since the 1997 publication of the first /Harry Potter/ novel, the “Potterverse” has seen the addition of eight feature films (with a ninth in production), the creation of the fan-interactive Pottermore© website, the release of myriad video games for multiple platforms, the construction of the Wizarding World of Harry Potter at Universal Studios, several companion books (such as /Fantastic Beasts and Where to Find Them/), critical essays and analyses, and the 2016 debut of the original stage play, /Harry Potter and the Cursed Child/. We invite essays for a collection that explores the topics/themes/ideas in the companion works outside of the 7-book original canon /Harry Potter/ series. Specifically, we are looking for essays that explore the cultural implications of these narratives and the way fans (and critics) negotiate these narratives in a post-modern, convergence culture world. We anticipate that this collection will include 16-20 essays, and as a working guide, the essays should be 4000-4500 words. Essays must adhere to the most current MLA format. Submission Guidelines: Please send a 500-word proposal in Word, followed by a short bibliography showing the paper’s scholarly and theoretical context. Please also include a short professional description of yourself. We are delighted with the many wonderful abstracts we have received, and thank all prospective authors for their proposals. The extended deadline for submissions is September 17 2016. Please see the original CFP (below) for submission instructions. Australian fans have access to a wide array of popular culture content from around the world, developing relationships with these products that are as rich as fans from other parts of the globe. Until recently access to media products is limited by temporal and spatial distance from countries of origin. Yet, at the same time practices from diaspora communities to preserve cultural identity introduces a multitude of global media content to a wider Australian audience. Australian fans thus engage with a mixture of ‘conventional’ and ‘niche’ media products that places them both within the margins and in the mainstream. While there may be parallels between Australia and other nations with multicultural communities, the geographical location, history and cultural mix of Australian society give rise to unique contexts shaping the consumption and practices of Australian fans. We thus ask the question: What makes the Australian fan experience unique? What influence does geo-political location have on the consumption and appropriation of popular culture in the Australian context? What impact does Australian multicultural society have on exposure and access to popular culture? What drives Australian fan interaction with global popular culture, and how does this interaction intersect with narratives of ‘Australian-ness’ in local and globalised contexts? This book seeks to explore the specific and unique experience of being fans living and Australia. Please email 300 word abstracts and your CV to both Celia Lam and Jackie Raphael by September 17 2016. Proposals should be for original chapters that have not been previously published (including conference proceedings), and are not under consideration from other journals or edited collections. Jenkins has described himself as an “Aca-fan”, a term that first gained currency in the early 1990’s. Jenkins is further credited with helping in the wide-spread popularization of the term, together with Matt Hills’ concept of the “fan-academic”, that describes an academic who consciously identifies and writes as a fan. Jenkins’s theories was extensively discussed in 2011, in a special issue of Cultural Studies edited by James Hay and Nick Couldry but this volume did not focus on the Aca-fan concept. Furthermore, over the past several years and in spite of the Hills or Jenkins partial responses (Hills has enlighten his approach of the acafan in « Media Academics as Media Audiences: Aesthetic Judgements in Media and Cultural Studies », 2007) and the few papers published worldwide (Maigret-Macé, 2005; Booth, 2013; Cristofari-Guitton, 2015, Gimello-Vilatte, 2015), the academic community (including fandom studies scholars) had not yet deeply explored the perimeter of the Aca-fan concept as a whole topic of study. 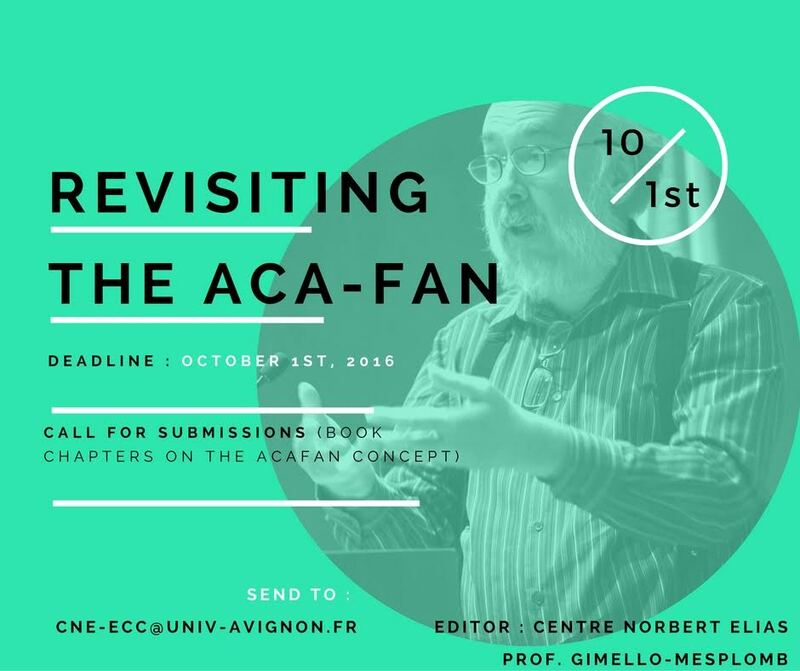 More recently, Paul Booth acknowledged that the ‘Aca-fan’ “does not do enough to involve fans in the process of research”, (Booth, 2013) while Bruno Cailler and Cécile Masoni observed an antagonism between both communities (Masoni-Cailler, 2015). Paradoxically, while Jenkins most powerful concepts such as transmedia convergence or participatory audiences were dissected worldwide, the Aca-fan heuristic values remain relatively neglected and under-discussed within the academic field. Guided by these questions, we are seeking chapters for an edited collection that historicizes, interrogates and problematizes the Aca-fan concept as a stimulating framework. The aim of this edited volume is to both revisiting and reinterpret, from an epistemological perspective, several research defined key concepts that have formulated “fan-academic” propositions with and beyond Hills and Jenkins among others. Editors are especially interested in testimonies from academics engaged in emerging academic fields, where the Aca-fan concept is familiarized such as studies in performing arts, popular music, digital games, media studies, communication sciences, or audience theory and media epistemology, just to name a few. *Analyzing early profane and academic works, prior to Hills and Jenkins, that are devoted to academic fandom such as “An Ethnography of Star Trek Fandom” (Di Costanzo, 1977) or “Thinking About Slash/Thinking About Women” (Bjorklund, 1988), among others. *Case studies stemming from scholars implementing the Aca-fan concept in their classes and further questioning the impact of such, from an epistemological perspective. *Discussing Social Science Methodology through the Aca-fan: Is the scholar a fan just “like the others”? *What is the concept meaning to non Aca-fan scholars? *Legally introduce scholar’s tastes and quality judgment through academic writings: A (new) form of criticism? Please submit a 500 word abstract, a list of 10 references and a brief biography to Centre Norbert Elias – Prof. Frédéric Gimello-Mesplomb (cne-ecc@[alt]univ-avignon.fr) by *October 1st, 2016. *Successful submissions will be notified on October 15th. Upon acceptance, full articles (between 6000 and 8000 words, including references) will be due at the latest on the 1st of December.